The LC Lauren Conrad for Kohls Spring 2010 Lookbook is out, featuring the reality-star-turned-designer's latest feminine apparel with a cool California girl vibe. Christian Louboutins not included, sorry! But there's still plenty of fab stuff to choose from, I'm loving the moto jacket, boyfriend blazer and sequin cardigan. The bold blue dress is also calling my name. I'm ashamed to say I still haven't seen this line in person, but I promise to get on that soon. Who's loving the latest spring offerings? Have you shopped it yet? Keep reading to see the complete collection! As temperatures rise, reach for something lighter (think pale neutrals in bone, taupe or gray) and brighter (turquoise blue and tomato red are two great picks). 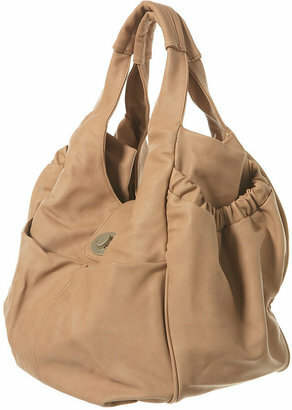 Here are ten handbag trends you'll want to bag for spring 2010. After I wrote this post, I became slightly obsessed with finding the perfect stacked crystal ball lamp. The fab fashion blogger behind My Bare Style recently realized a dream by opening up her very own online store called Seventh Door. There you'll find a well-edited selection of on-trend tops, dresses, skirts, accessories and shoes—all at budget-friendly prices (everything's under $75!!). Always awesome to see a blogger doing what they love! Show some love: Enter code budgetbabe at checkout to receive 20% off of any Seventh Door order. Expires 4/2/10.